This articles is outdated, we are currently working on a new guide. Java Development Kit (JDK) , choose the latest Version of Java 8. Other version might work, but are not officially supported. We recommend to use the linked version 8.0.9. We are dependent on the compatibility with JSPWiki here. You might get a community key for the Ultimate Edition. Please ask via dev list. Please do also take a look at the screencasts that show the set up of an IntelliJ workspace. When you first start IDEA you can choose which plugins to enable/disable. Just leave everything enabled to be on the safe side. After that choose "New Project" and then "Empty Project". Give it a name and hit "Ok". Set IntelliJ to automatically import checked-out or created maven modules: Settings -> "Maven" -> "Importing" -> activate "import maven projects automatically"
Select "VCS -> Checkout from Version Control -> Subversion". To get an account, please contact info@d3web.de . Accounts on d3web.de are independent from the SVN accounts. Select the three main projects (d3web, KnowWE, and Research) as well as KnowWE-App from inside the trunks of the three repositories. They are in the trunk/folders respectively. One by one, right click one the projects and select Check out and choose your Idea project folder. After that, select the following path $yourprojectname/$projectparent (usually the one in the middle). When IDEA has finished checking everything out, select "File -> New/Module from Existing Sources..." and choose your project path. You get asked which module to import, choose "Import Module from external Model/Maven" and hit "Next". In the next screen hit "Next" again and "Finish" afterwards. Select "Run -> Edit Configurations" and add "Tomcat Server -> local". Hit configure and choose your tomcat path. In den bottom pane click "+" and choose "Build Artifacts". Select "KnowWE-App:war exploded". Click on the "Deployment" tab and add "KnowWE-App:war exploded". Select as Application Context "/KnowWE" and click on "Ok". Build KnowWE by clicking on the green arrow right next to our new tomcat configuration. To make Eclipse work with Subversion, Tomcat and Maven, you will need a few additional plug-ins. Navigate to Help -> Eclipse Marketplace. Search for Subversive and install the most recent Subversive - SVN Team Provider, e.g. 2.0.1. Click "Install" and follow the instructions. Accept the licenses, and finish the installation. Restart Eclipse when you are asked to. For eclipse versions Kepler (and later?! ), you need to install Java 8 support manually. Go to Eclipse Marketplace again and search for "java 8 kepler". Then choose and install the following. Follow the installation procedure and restart as needed. After restarting Eclipse, click on Window -> Open Perspective -> SVN Repository Exploring. A dialog window will be opened asking you to select an SVN connector implementation. Select SVNKit 1.8.7 (or the latest available SVNKit version of the 1.8 branch, not 1.7 ) and finish the installation wizard. 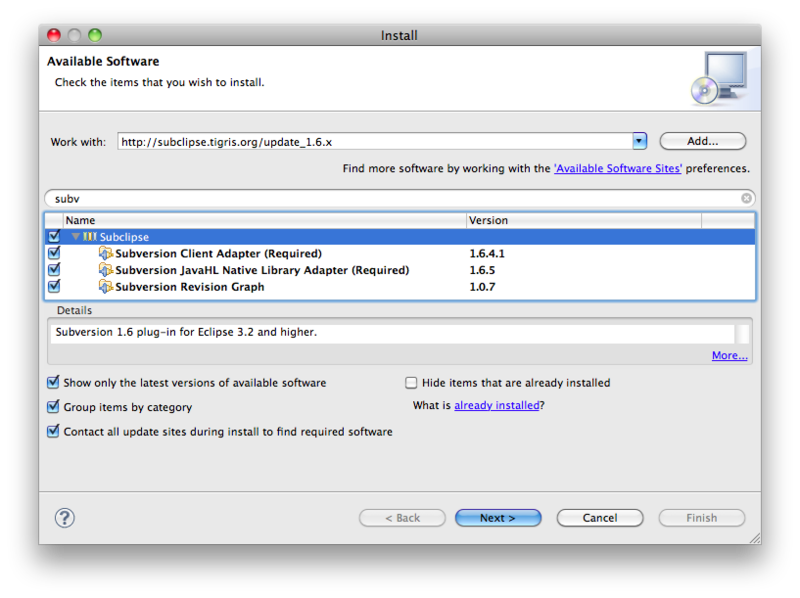 You need to accept installing unsigned software, and restart Eclipse again when asked. The Sysdeo Tomcat Plug-in allows you to start Tomcat directly from within Eclipse. You can find it at http://www.eclipsetotale.com/tomcatPlugin.html . To perform the installation, download the .zip file provided at the author's homepage and unpack it into the plugins/ folder inside your Eclipse installation. The KnowWE-App project is preconfigured for use with this plug-in. "C:\Program Files\eclipse\eclipse.exe" -vm "C:\Program Files\Java\jdk1.8_xxx\bin\javaw.exe"
You can find the following Eclipse settings in the main menu at Window -> Preferences. Encoding: General -> Workspace -> Text file encoding: "UTF-8"
The screenshot on the right shows the actions, that have to be activated. Window -> Open perspective -> Other… -> SVN Repository Exploring. Select the three main projects (d3web, KnowWE, and Research) as well as KnowWE-App from inside the trunks of the three repositories. They are in the trunk/folders respectively. One by one, right click one the projects and select Check out and click Finish. Eclipse EE will find a lot of JSP Problems and display them in the Markers tab. You can ignore them, they are found because of the way we extend JSPWiki. To get rid of them long term, right click on the project KnowWE-Resources and select Properties. Go to Validation and select "Enable project specific settings". Now, deactivate the checkboxes Build for "JSP Syntax/Context Validator". The checkboxes "Manual" can remain checked. If you now right click on the JSP Problems in the Markers tab, you can delete all of them. They will stay deleted unless you build manually. Copy KnowWE-App/src/resources/local/WEB-INF/jspwiki-custom.properties.default to jspwiki-custom.properties in the same directory. 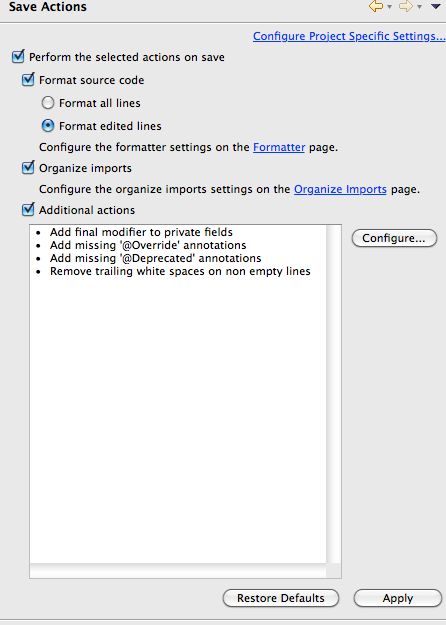 Do not rename it in Eclipse. In jspwiki.properties, edit the settings for your local environment. The three most important settings are at the top. One by one, right click the main projects d3web, KnowWE, Research and select Run As and then "Maven install". Wait for the for the current one to finish before you install on the next one. Right click on "KnowWE-App", select Run as -> Maven build…. Enable checkbox "Resolve Workspace artifacts"
The line breaks are important! -Xmx2g says, that eclipse can use up to 2GB of RAM. These 2 GB are recommended, but if you do not have that much to spare, something around 1500m is also ok.
To solve this, you have to add some arguments for the Java Virtual Maschine in your run configuration. Remove the affected projects from the workspace without deleting them, by selecting 'Delete' from the context menu and unchecking the checkbox. As root directory select the project directory itself, e.g. <workspacedir>\d3web-KnowWE\d3web-distributed. Select the project in the list. Repeat step 2 for every project that was affected.